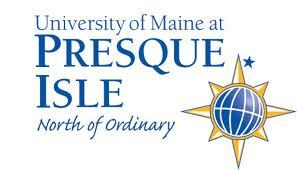 For more than a century, the University of Maine at Presque Isle has been helping students find their path to great professional careers. We provide 1,400 traditional and non-traditional students with life-changing opportunities in a caring, small-university environment. UMPI combines liberal arts and selected professional programs and serves as a cultural and educational resource for the entire region. As a public institution, UMPI operates under the supervision of publicly appointed officials, and is supported primarily by public funds. UMPI is one of seven autonomous campuses within the University of Maine System. The University has adopted a learning focus that embraces the curriculum, student life, even the classrooms themselves. It's called adventurous learning - intellectual, cultural, and outdoor adventure in an extraordinary natural and cultural environment. This kind of learning provides opportunities for personal discovery and individual adventure so that students develop the skills and self-confidence to succeed in life. Our campus sits on 150 acres surrounded by the rolling hills and potato fields of northern Maine. The city of Presque Isle offers opportunities for both summer and winter outdoor sports and is the primary commercial center of the region. Combining clean air, clear skies, and safe small-town life next door to the Northern Maine Woods, it also boasts blue-ribbon schools, a regional airport, and easy access to nearby Canada.